This entry was posted in Blog, My Town Monday and tagged author, Camaro, castles, Columbus, Dayton, driving, historic homes, Jennette Marie Powell, My Town Monday, Ohio, paranormal romance, Piatt Castles, romance, things to do, Time's Enemy, Time's Fugitive, writer. The closest thing here is someone tore down 3 houses and built a mansion. I don’t think Alberta has castles. If I ever got really rich I would buy a huge chunk of land and build Castle Asrai. That looks beautiful. 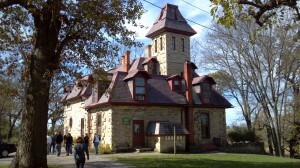 It reminds me of the Bishop’s Palace in Galveston, about a half hour from me (http://www.galveston.com/bishopspalace/). Great architecture and history. Asrai – Castle Asrai, I love it! 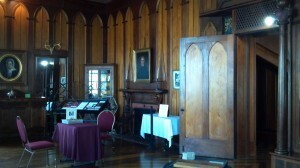 Julie – I’ll have to check out the Bishop’s Palace if I ever get to Galveston. Thanks to both of you for stopping by! Also, I just realized I forgot my link to the My Town Monday blog – not much there today, but there’s usually some fun places from around the U.S.! Strangely enough, even though I live in a small town, we have an almost castle in the center of town. It’s probably not big enough to really be called a castle, but it has castle-type details, and it’s 3-4 times bigger than any other home. Very cool to know there are these mini-castles everywhere. Sounds cool, Marcy! These are in the middle of nowhere, so that’s part of their best-kept-secret status. Thanks for sharing! What a gorgeous place! It reminds me of a historic home in Minnesota. If/when I travel through Ohio, I’ll be sure to check it out. Many of the “castles” (more like mega-mansions ;)) in S. California have less personality and history, IMHO…unless you’re into celebrity factoids and the like. Hoping to travel up the coast sometime soon, as there are numerous old castles worth visiting. I love castles–it almost looks like the one I stayed at in Ireland once! It’s interesting all the treasures our country has tucked away! Wow Jennette – that’s beautiful! Looks like a gorgeous day. 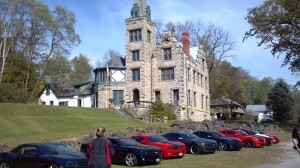 And all those Cameros – my goodness, I need to get my bad self to Ohio! Let’s see, the closest castle in my area is actually a house made from the old glass 7-up pop bottles into the shape of a castle. Colleen – so true! I love discovering not-so-well-known goodies like this. I have to give credit to one of my Camaro friends, who organized the cruise. It was all fantastic! Patricia – 16 Camaros was certainly something to see, especially against the backdrop of the beautiful countryside. Thanks for stopping by! Sheila – These were definitely new to me! I saw a house built of bottles in Death Valley, but it was tiny. That castle must be amazing! No telling where you and that Camaro will end up next! I found this post very interesting. My husband was raised in Ohio and he knew nothing of these castles. Very cool! My husband and I love Camaros. We had a ’71 and ’79, but that was a while ago. I enjoyed my tour. Can’t wait for the next one. See you soon! Very cool! I love visiting places like this. Drag the husband through them whenever we find them. Of course out here we have the famous Hearst Castle. But in the small town where I grew up we have a less famous castle I had planned to visit at some point for my blog. The owner built it himself out of all kinds of things. It’s pretty crazy and looks like a fortress from the outside. Not a big beautiful building. I remember touring it with my Sunday school class as a kid. Very true, Karen! My husband has a ’79 Trans Am and I also have a ’99 Firebird, so we are definitely an f-body family. Sounds cool, Debra! I’d love to see Hearst Castle. You have so many fun sights to see in SoCal. Like my Alberta friends, I’m not aware of any castles in our province. There’s an awesome one in Victoria…But I never thought of one in Ohio. thanks for the trip into the unknown.